I Slipped In Tesco Can I Claim Compensation? – How Much Can I Claim For A Personal Injury From A Tesco Slip or Fall? Accidents can happen anywhere – on the street, at work, on holiday and so on and so forth. A supermarket is a place whereby accidents occur now and again. The main type of incident is a slip. Someone may have Spilt a product causing another individual to hurt themselves. Whether or not the supermarket is at fault can be somewhat difficult to work out, which is why it might be a good idea to call on Advice.co.uk – 0161 696 9685 – to assist with making a claim if you have slipped in Tesco. If you have been injured in such an accident, all you need to do is give us a call. But first, read on to discover everything you need to know. What Is A Slip, Trip, Or Fall In Tesco? How Much Compensation Do You Get For Slipping On A Wet? Slipped On Water At Work – Can I Claim From Tesco? I Slipped In Tesco, How Do I Start A Compensation Claim? All supermarket owners have a responsibility to ensure that their premises are safe. This is not only for those that shop in the supermarket, but also those that work there and drop off supplies and such like. The Occupiers Liability Act 1957 makes it a legal responsibility for all owners to take the necessary steps required of them to ensure this. Nonetheless, they cannot be blamed for every single incident that occurs, as it is somewhat impossible for all risks to be eliminated. Therefore, it comes down to whether they have done all they can to prevent the accident in question, which is where the difficulty lies for a lot of injury victims. In this guide, we will help you to determine whether you have the basis for a personal injury claim because you have slipped in Tesco. We will reveal everything you need to know about these claims. This includes looking at specific claims, whether you have slipped on a banana in Tesco or slipped on ice in Tesco car park. We will also provide you with information on the claims process, including the payout you may receive, how to make a claim, and the service that we provide. If you still have queries by the time you get to the end of the guide, please do not hesitate to get in touch. If you have been involved in a slip in a public place, like Tesco, you may be wondering whether you are able to make a claim. This can be a process that is confusing and overwhelming for a lot of people, especially those that have no experience with compensation claims. The first thing you need to do is determine who is at fault for the slip you have been involved in. Establishing liability is the most vital aspect of any claim. You need to show that you did not cause the incident. If you slipped because of your own clumsiness, for instance, you will certainly not be able to claim. However, if you slipped because there was a spillage on the floor and it had not been marked, or cleaned up in a timely manner there is a chance that you will be entitled to compensation. So, who is to blame? Well, this all depends on where the incident occurred. If you were in a supermarket or any type of shop, then it will be the business’s responsibility. However, if you slipped/tripped on a public pavement outside of a supermarket, then it is likely to be the responsibility of the local council rather than the supermarket. It all depends on whether it was on the supermarket grounds or not. If you are not sure, do not worry. When you give us a call, and explain your case to one of our advisors, they will be able to determine this for you. Aside from this, there are two other key factors you need to bear in mind. Have you seen a doctor for your injuries? This is crucial if you are to claim, as the medical report that is provided by your doctor serves as the case’s most important piece of evidence. Last but not least, the incident must have occurred within the personal injury claims time limit. How Much Compensation Do You Get For Slipping On A Wet Floor? How much compensation do you get for slipping on a wet floor? This is a difficult question to answer. There is a lot of conflicting information on the Internet. Not only this, but injuries from slips differ significantly from person to person and so it can be hard to figure out what you can expect for your case specifically. You may have come across a personal injury claims calculator online, however these are not very accurate. The best thing to do is look at cases that have been made before to get a good understanding regarding the average slip and fall compensation amounts or use our table below which shows amounts from the Judicial Court Guidance. We have put together these details in the table below. If you cannot find the injury you have sustained in the table below, please do not hesitate to give us a call for more information. To begin with, you have general damages. This is the money you will receive to compensate you for the suffering you have experienced. This is calculated based on the severity of your injury and how it is impacting your everyday life. Aside from this, there are special damages. These are out of pocket expenses that you have incurred because of the injury. You can claim for any medical costs, from treatment expenses to counselling costs. Have you had to pay for hospital parking? Maybe your car has had to be adapted because of your injuries? Have you had to pay someone to look after your children whilst you recover? Has someone had to look after you while you recover? If so, they could claim for this. Have you lost income because of your inability to work? When it comes to workplace accidents, slips, trips, and falls are the most common. According to HSE, they make up 31 per cent of all workplace accidents. If you have slipped on water in Tesco while you have been working there and you are injured then you may be entitled to compensation if there is negligence. All employers owe their workers a duty of care. This means that they need to provide a safe and healthy working environment. If they have failed to do this, then you may be entitled to compensation. You may be able make a claim if you have slipped on food at Tesco. This is a common cause of slips, trips, and falls in supermarkets. This will often happen when a product, such as a glass jar of sauce, has broken on the floor. If it has not been cleaned up as quickly as it should have been or there has not been a warning sign put up, you could be able to make a claim. A twisted ankle or another soft tissue injury is the most likely outcome in these incidents. If there is one type of food that is slippery, it is yoghurt! It does not help that yoghurts seem to be housed in the most flimsy form of plastic, which is guaranteed to split if you drop it on the floor. 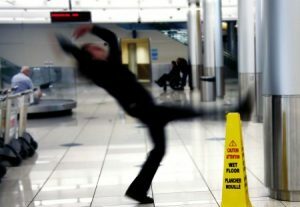 If you have slipped on a spill in a supermarket because of yoghurt that has not been cleaned up quickly enough or properly or sign posted and you are injured, call us to get some actionable advice. The snow although very attractive to look at can be very dangerous, the ice that comes with it can be a nightmare. If you slip on the ice in a supermarket or on its premises and suffer an injury you may be entitled to compensation depending on the circumstances of your case. One of the difficulties when it comes to this type of accident claim is proving that someone else is at fault for the injury that you have suffered. After all, you will not be able to claim compensation without supplying sufficient evidence to show that someone else has acted erroneously or negligently and this has resulted in your suffering. When it comes to this, you should think about the place in which you were injured. If you slipped outside of a shop or supermarket, i.e. on business premises, you could potentially make a claim against the company in question. If you slipped whilst at your place of work, you could make a claim against your employer. You need to be able to prove that the responsible party had not provided the level of care they should during icy conditions. However, establishing what is the right level of care is not easy. We advise, if you have been injured on the ice, get in touch with Advice.co.uk. One of our experienced advisors will determine whether you have a good chance of getting compensation. If you have experienced an accident while in any supermarkets in the UK that you feel was not your fault, you may be able to make a claim. This is because the supermarket owes you a duty of care, and if they have failed in this, then they are deemed to be negligent. There are a number of rules and regulations that are in place. The Occupiers Liability Act of 1957 is a good starting point. This outlines that all supermarkets need to do everything in their power to keep you safe while you are on their premises. An example of a case whereby someone could slip on food in a supermarket. In this case sample a supermarket employee was trying to move a roll cage in the freezer room they were working. Water had dripped around the wheels, freezing it into place, meaning the cage could not be moved. The employee slipped on the ice when trying to move the cage, and to make matters worse, some products from the cage fell on top of him. Despite reporting the incident immediately, it was not added to the report book. The worker had some bruising and fractured his ribs. Claims such as slip trip and falls are all different and can take different times to complete. What is more important is how long you have to make a claim. As mentioned earlier, there is a time limit on all personal injury claims. Please view the table below. Workplace accident 3 years from the accident or knowledge of injury. Public accident 3 years from the accident or knowledge of injury. Before you find yourself a quality solicitor we advise that you have all of the evidence to prove that you suffered an injury at a supermarket. The first thing you need to do is to seek medical help. This does not mean you have to call an ambulance and rush to the hospital. Of course, if your injury has been that bad then it is likely that someone will have called the ambulance for you. Nevertheless, the point being made is; no matter how big or small your claim is medical help is essential. Even if you think the pain will subside, make sure you visit a doctor. The medical report that the doctor will make is substantial for your injury claim. A medical visit shows that you have experienced an injury. Nevertheless, you should not merely stop at the doctor or hospital visits. We advise you gather other evidence. Take pictures of your injuries. This is a great method of evidence and is highly recommended. In addition to this, it is advisable that you write down as much as possible about the incident. After all, it is easy to forget details after they have occurred. Moreover, something may seem like the littlest detail to you but may actually be considered significant by your solicitor. Therefore, get a document; write down the date, time, location and then everything else that comes to your mind regarding the incident. All personal injury lawyers we match people with work on a No Win, No Fee basis. This presents many benefits for you. 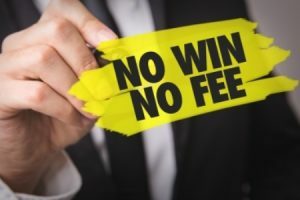 These claims mean that no money is needed for you to begin your case. Moreover, the financial risks associated with a traditional service are eliminated. You can, therefore, be sure you will benefit from a service that your solicitor has invested in, as it will determine how much they get paid. Instead of fretting about whether you have the basis to file a personal injury claim against the Tesco supermarket in question, simply get in touch with Advice.co.uk instead. We have a legal helpline available. All you have to do is dial the number and you will speak to one of our friendly and experienced advisers. They will answer all of your queries and will give you their honest expert opinion regarding the strength of your case. If they think it is worth making a claim they will then put you in contact with a specialist No Win, No Fee personal injury solicitor. We make the claims process really easy as well. Simply follow the three-step process below. If you have been injured at Tesco and you want to make a slipped in Tesco claim, all you need to do is give us a call. You can reach us on 0161 696 9685. This is our claims line and it is open seven days per week, from 9 am until 9 pm. It is not only for those who are ready to make a claim but also those who simply have questions to ask. There are other ways to contact us too. You can enter your contact information and we will call you back at the earliest opportunity. HSE Slips information – More information about slips and their risks.